This year’s winner of the Nokia Foundation Award is Professor Jaakko Astola of the Tampere University of Technology, who has been studying, writing and teaching in the field of signal processing for four decades. Signal processing is the science of extracting information from raw data, be that sounds, pictures, numbers or radio waves. As such, it’s obviously a vital part of the science that makes mobile devices possible. The professor’s contributions to the telecommunications industry include studies in mathematics, information theory, nonlinear signal processing, and a wide spectrum of applications in engineering, all of which have had a profound impact. The award also recognises his exemplary career and devotion to scientific research and teaching. Professor Astola began his academic career with work in data correcting code back in the seventies, before moving on to areas such as image processing and compression. His work is one of the reasons that we’re now able to view and shoot videos on a mobile device, for example. While the professor has recently turned 60 and professes a love of billiards and horses, there’s no suggestion that he’s likely to retire soon and says he wishes to devote his energies to further research for years to come. “This year’s award focuses on the encouragement of profound science, where often many years pass before the world can reap the benefits from the research. It is a great honour to recognize an individual whose long-term work in science has created a platform for many technological breakthroughs. 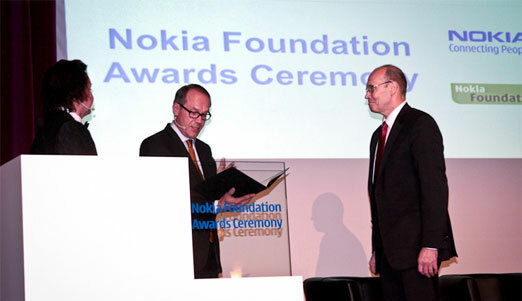 Professor Jaakko Astola is being awarded particularly for his contribution in the development of sophisticated signal processing methods that have been used in many ICT applications including cell phones.” said Henry Tirri, head of Nokia Research Center and Chairman of the Board of the Nokia Foundation. The Nokia Foundation, formed in 1995, supports the scientific development of information and telecommunications technologies and promotes education on these topics in Finland. It also awards scholarships to help PhD students complete their studies. This year, the total grants awarded, including 75 Nokia scholarships, the Fulbright-Nokia Distinguished Chair grant and visiting professor grants is EUR 471,700.